The Tony Award-winning musical In the Heights is making its Southern California premiere this summer, running June 22-July 25 at the Pantages Theatre in Hollywood before moving to the Orange County Performing Arts Center August 3-15, 2010. Chris Carpenter, recently interviewed the handsome and talented cast member, Wilkie Ferguson. The musical’s creator/composer and Broadway star, Lin-Manuel Miranda, is set to headline the LA production (but not the OC run). Sharing the stage with him will be 29 of the most talented actors, singers and dancers in musical theatre today. Among them is Wilkie Ferguson, an openly gay, African-American resident of Southern California. 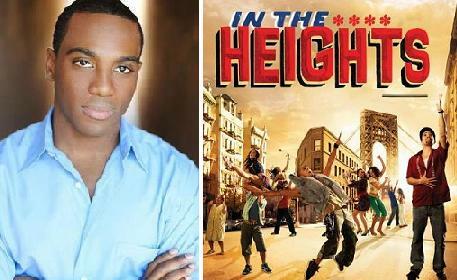 Ferguson recently called shortly before a Friday night performance of In the Heights in Denver, Colorado to talk. Prior to In the Heights, Ferguson was a member of the ensembles of such popular musicals as Hairspray, Sister Act, Stormy Weather (starring Leslie Uggams as the late Lena Horne) and Ray Charles Live! He also served as assistant director/piano accompanist for the acclaimed Boys’ Choir of Harlem. I asked Ferguson whether there is any GLBT content or message in the show. MORE Popular posts on QTC! VIDEO: Scissor Sisters cover Kylie's "All The Lovers"
OMG! Watch parody of OLD LADY GAGA doing "Alejandro"
There's something queer about this situation!